Finally hitting shelves a month after the iPhone XS and iPhone XS Max, the iPhone XR is a cheaper alternative to Apple’s flagship devices. I say ‘cheaper’ but at £749/$749, this is far from the budget iPhone many were expecting before launch. Instead, Apple here takes the formula set by the iPhone XS (and the iPhone X) and slightly tweaks it to fit the lower price. There’s only one camera on the back, the stainless-steel rim has been swapped out for aluminium (as on the iPhone 8) and LCD replaces OLED as the tech used in the screen. iPhone XR release date – When’s it out? The iPhone XR is available now from Apple directly and networks like EE, O2 and Three. Check out our best iPhone XR deals for more information. iPhone XR price – How much does the iPhone XR cost? The iPhone XR starts at £749/$749 for the 64GB model. £799/$799 for the 128GB version and £899/$899 for the top-end 256GB model. Each of the available colours – coral, blue, yellow, black, white, (PRODUCT) RED – can be picked up in all sizes and cost the same price. 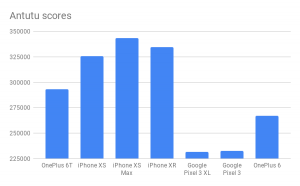 Where I think the iPhone XR beats the XS is in design. It doesn’t feel as ‘classy’ but the aluminium band is less slippery than the latter’s stainless steel and the 6.1-inch screen size feels like a nice compromise between the 5.8-inch iPhone XS and 6.5-inch XS Max. It looks very much like a mashup of the iPhone X and iPhone 8. There’s glass on both the front and the back, and it holds an IP67 rating, meaning it can be submerged in a variety of liquids for up to 30 minutes. But there’s still no headphone jack here, and not even a 3.5mm dongle inside the box. Even though it follows the near edge-to-edge look of the iPhone X, there’s a thicker bezel here surrounding the display. This becomes slightly more prominent when you’re using a coloured variation of the iPhone XR. With my red review unit, for example, the black bezel stands out more against its bright red sides. I do find it odd that even though Apple is positioning this as the default iPhone pick, it’s not offering a smaller version. I know lots of people who still find the iPhone 8 too big and too long, and would prefer something more pocketable. The iPhone XR certainly isn’t that. But being able to pick up this phone in a variety of colours makes it a bit more interesting. There’s a pinky-orange coral, a vivid red and a couple of more pastel shades of blue and yellow. For those who want something a bit more conservative, there are also white and black options. The range of colours is great and there isn’t one that stands out as looking ugly: they’re all coloured well and each reacts a bit differently when light hits its glass back. The feature most people have been concerned about with the iPhone XR is the screen. Not so much because of the switch back to LCD rather than OLED, but for the seemingly meagre 1792 x 828 resolution. This gives the same 326ppi as the iPhone 6, iPhone 7 and iPhone 8 – but it’s far from the 1080p resolution of the Plus range of iPhones. Apple is calling this a Liquid Retina display, a moniker it has also attached to the iPad Pro 2018. After using it for an extended period, I honestly think it’s fine. If you’re coming from an iPhone 7 or 8, you’ll feel right at home. And if you have an iPhone X, you’re probably not going to be thinking about getting the XR anyway. LCD lacks the punchy colours, perfect blacks and support for Dolby Vision/HDR10 that the OLED on iPhone XS gives you. But in normal use colours are still pleasant and you can’t spot individual pixels unless you really go searching for them. To my eyes, the screen is a little more yellow than the OLED on my iPhone XS Max. However, that might just be the True Tone (Apple’s software tweak that makes colours softer on your eyes in certain environments) tech doing a bit too much work. Like all of Apple’s current iPhones, the screen is ridiculously responsive. The panel itself remains 60Hz but the touch-layer is 120Hz and your swipes and taps are registered instantly. Impressively, Apple has managed to ensure the curves in the corners of the screen and around the protruding notch are perfectly uniform – without any stray pixels or wonky edges. This is done through a combination of pixel-masking and anti-aliasing, and the results are excellent. Look at any competing Android phones with LCDs and curved corners, and you’ll notice ugly jagged edges. Sitting at the top of the screen is a notch – a small-ish cutout, where the bevy of Face ID sensors and front-facing cameras sit. In the year since Apple first introduced a notched-style device, it has become popular for Android manufacturers to follow suit, with many making it part of the design. Your feelings on the notch will likely be very varied and that’s fair – it does get in the way when watching videos. For everything else, it blends into the background and doesn’t detract from what’s on the display. Powering the iPhone XR is Apple’s A12 Bionic SoC (system on a chip) paired with 3GB of RAM. This is the same chipset used in the iPhone XS and iPhone XS Max. However, both of those phones have 4GB RAM. Being a 7nm chip, as opposed to the 10nm chip of the A11 Bionic, allows a greater number of transistors to be packed inside the silicone. This leads to a more efficient chip. The main features for the new chip are a 15% faster CPU, 50% faster GPU (both when compared with the A11 Bionic) and a new neural engine for AI. There’s also an updated ‘secure enclave’ inside the chip that aids the snappier Face ID. The general processor improvements aren’t huge when compared with the 2017 iPhones. But for anyone updating from an iPhone 6, iPhone 6S or iPhone 7, you’ll notice everything moves a lot quicker. Apps open instantly, there’s no jank when multitasking and I’ve noticed app crashes are very rare. There’s so much power available here that you’ll likely not utilise it all straight away. Apple’s having a big push with augmented reality (AR) and this will demand more power when developers really start to push it to its limits. 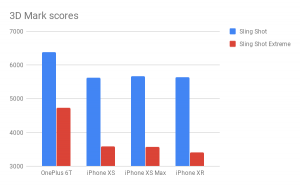 The A12 Bionic should also allow the iPhone XR to stay fast for multiple years. When you think Apple has only just stopped selling the four-year-old iPhone 6S, it becomes obvious this iteration will be around for a long time. Of course, I can’t comment on how fast the iPhone XR will be 18 to 24 months down the line. But Apple’s recent focus with iOS 12 on ensuring legacy devices still perform well gives plenty of hope. The iPhone XR is a great pick too if you’re an avid mobile gamer. It doesn’t pack some of the fancy features you get with the Razer Phone 2 (120Hz refresh rate) or ROG Phone (a mix of gaming-focused accessories). But instead, it offers plenty of power and the wide-range of excellent games available on the App Store. 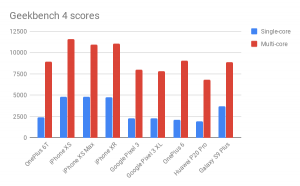 Intensive titles, such as Asphalt 9 and PUBG, run fantastically well and match the pricier iPhone XS for loading and frame rates. For benchmark scores, see below. For all new iOS devices in late 2018, Apple has completely moved away from Touch ID fingerprint unlocking. Putting so much faith in its Face ID facial unlocking means it has to work reliably. Thankfully, Apple succeeds with this: Face ID is reliable at bursting into life when you look at the phone and it works even in a pitch-black environment. Unlike some more basic facial authentication systems on other phones, Face ID can’t be fooled by a photo and learns your appearance over time. You won’t have to retrain it if you get a haircut or shave off a bushy beard. It comfortably recognised me with or without my glasses. iPhone XR will likely be a lot of people’s first experience with Face ID and I can’t see many of them being disappointed. The speakers (one of which sits on the bottom and other in the notch) are louder and clearer than those on any previous iPhone, matching excellent Android handsets out there (apart from the Razer Phone 2). Apple has levelled out the sound so that the downward speaker is no longer more powerful. This gives you a more balanced sound that isn’t dominated in a particular area. Call quality and wireless reception are both good, but not to the level of some other phones out there. On both the Huawei Mate 20 Pro and Samsung Galaxy S9, I get reliably stronger internet from my home router and tend to get better speeds on Three’s network when I’m out. 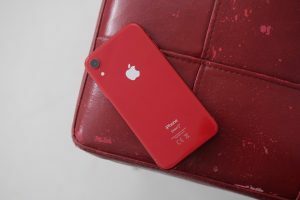 iPhone XR ships with iOS 12, which can now be upgraded to iOS 12.1. iOS 12’s focus on stability and reliability, particularly on older devices, means there isn’t really a massive user-facing change here. The general user interface remains the same: swipe up from the lock screen to access the standard gridded view of your apps. A left swipe brings up the Today view: a space for widgets to sit. It’s all very basic and will be familiar to anyone who has ever used an iPhone or iPad. Performance improvements aside, iOS 12 adds a couple of features that you’ll definitely want to look at. Screen Time is a new area in the Settings panel, designed to give you more control over how long you spend looking at your phone. 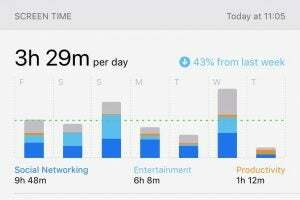 In addition to receiving a weekly overview of how much time you spend using specific apps, you can also restrict app use to certain times, or set a time limit. For instance, I set it up so that once I had spent 30 minutes on Instagram a day, it would block further access. This is great for parents too, as you can block whole categories of apps (social media, for example) during certain hours. iOS 12.1 adds in dual-sim support – but this is very much dependant on your network provider. You can now also have group call in FaceTime. Thanks to the Face ID system, there’s Animoji and Memoji on the iPhone XR. These augmented reality emojis blend your facial animations with various characters and can be pretty addictive. They’re limited to iMessage, which seems odd. Surely there must be plans to brand them off into a singular app? Due to the lack of a physical home button, your main interaction with the iPhone XR is through a selection of gestures. Swipe up from the bottom to go to the Home Screen, pull down from the top left for notifications and top right for Control Center. Once you’ve got over the initial learning curve, it’s mostly a straightforward process. 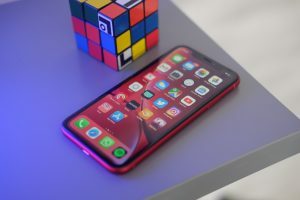 The post iPhone XR review: The best all-around iPhone you can buy right now appeared first on Trusted Reviews.